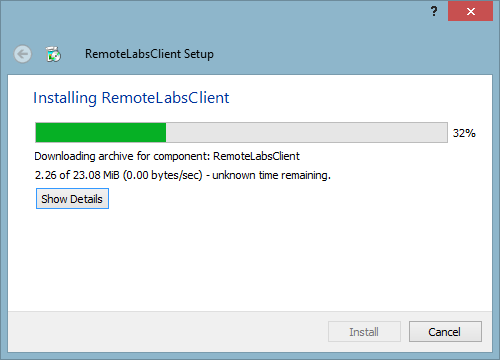 The Remote Labs Client is available for Windows and OS X. Please check the System Requirements for more information. In order to make sure that the Remote Labs Client works with your device, please read the System Requirements. Afterwards, please Download the right version for your OS in the Download area and open the file. Follow the installation routine. The picture below shows the installation dialogue for Windows. Open the client by clicking the Remote Labs Client icon in the start menu. After the client has been opened the first time you will be asked to adjust the window resolution for remote connections as well as the keyboard layout. Please Note: The Keyboard Layout affects the remote desktop sessions only. The terminal sessions are using your local keyboard settings. When working with VNC connections, the keyboard layout has to be adjusted on the target machine. Additionally a connection test will be performed to assure that all neccesary servers can be accessed. If you encounter a red result please check your firewall settings and click Recheck to test again. The picture below shows the settings dialogue for Windows. You can open the settings window later by clicking on the button. You will be directed to the actual login page of your Remote Labs Service. Please log into your lab by typing your username and password. Step 4: Start Your Lab! You are ready to start working on your lab now. Please follow the Guide. Please make sure that your device complies with the following system requirements. Remote Desktop sessions and console access to various types of server systems used in the Remote Lab environments is provided by X2GO Client. The installation and update process is handled by the Remote Labs Client. 56 kBit/s or higher multiplied with the number of Student- PCs. We recommend for 1-4 Pods: 400kBit/s, for 5-8 Pods: 700kBit/s and for 8-16 Pods: 1MBit/s. *If you are using a shared line e.g. for parallel trainings, ensure that you have enough bandwidth for each class. It is not possible to access the Fast Lane Remote Lab System directly using a Proxy. If a Proxy must be used due to company policies, please use the following solution. Note: This solution only works with Windows Clients. Identify the location of the lab in order to connect to the correct website. The lab location can be identified by looking at the data access mail. The subject will be in the form L-Labname-X123 for the labs running on remotelabs.flane.de. If the access data subject starts with REMOTELABS- the lab is located in Frankfurt. If you have difficulties identifying the location please contact our support team. Please check the Imprint for contact details. After identifying the lab location connect to the correct website. https://rlham-vpn.flane.de/RemoteLab if the lab is located in Hamburg. https://rlbbi-vpn.flane.de/RemoteLab if the lab is located in Berlin. https://rlffm-vpn.flane.de/RemoteLab if the lab is located in Frankfurt. Use the Username RemoteLabUser and the Password 1234QWer to login. This will start the installation of the Cisco AnyConnect VPN Client or if already installed the connection will be established. In order to install or connect, pop up requests have to be allowed. If the Cisco AnyConnect VPN Client is already installed make sure it is the correct version. Only version 3.1.05160 is supported. The correct proxy information must be set in the browser. This guide is designed for trainers and students without any prior experience who want to get started with the Remote Lab Service. 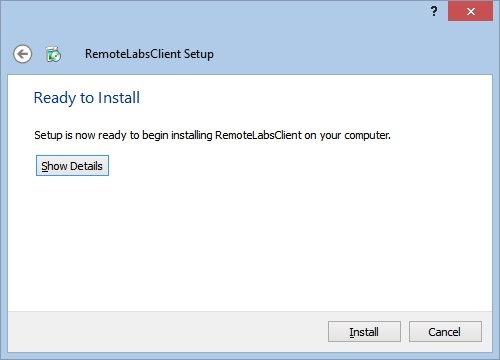 Please download, install and configure the Remote Labs Client and log into your Remote Labs Service. Read Installation and Configuration for clear instructions. After your login, you will reach the Start page. Basic information on your lab will be displayed. Please check the Notes-document for more information on your lab. Please click on Network Diagram(s) -> Pod x. You will be directed to your network diagram. Click on a device to access it. On the Lab Administration page a list of devices and the option to clear them is displayed. Please use the help content provided on the Landing Page. Additionally we offer personal support for trainers through our trouble ticket system. Please select “Support Tickets” after logging into your lab. What is the Remote Labs Client? The Remote Labs Client is a native application to guarantee easy lab access when working with the Fast Lane Remote Labs Services. You do not need to install any additional software as the client comes with everything you need to work on your lab. With which OS does the client work with? Currently the Remote Labs Client works with Windows and OS X. How can I find out where my lab is located? The access data sent by Fast Lane will come with a Labname such as „L-Labname-X123“. The X represents the location of the lab and is one of the following: H=Hamburg, B=Berlin, F=Frankfurt. If the access data subject starts with REMOTELABS- the lab is located in Frankfurt. If you have not gotten your access data, please contact the support team and ask them directly. How can I change the keyboard layout, screen resolution and terminal font size? You can change them in the Remote Labs Client settings area. Click the button on the right side to open the window. What kind of software is installed locally and how can I delete it? What kind of technology does the Remote Labs Client use? 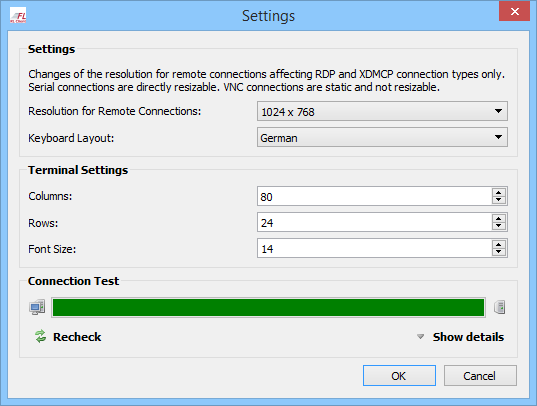 The Remote Labs Client works with the remote desktop solution X2Go. Read more here. When I try connecting to a device I get the message Error  No master session found. A master session has to be established first. You are logged in with the trainer account which is not able to connect to devices without an established student session. Please use the student account to connect to devices. The trainer account can only ghost sessions from students. I am logged out. How can I send “Ctrl” + “Alt” + “Del” to login again? Press <F8>, then “Send ctrl-alt-del”. I’m not able to connect to any device in my lab using a proxy. It is not possible to access the Fast Lane Remote Lab System directly using a Proxy. If a Proxy must be used due to company policies, please see the proxy section in the System Requirements. How can I clear lines using Remotelabs 1.0? When you are logged in as a trainer you can clear lines using Lab Administration in the menu. This only concerns Remotelabs 1.0. When I try to connect I get a message that there is an existing session but I cannot clear it. Please check if there is a local firewall blocking your access. How do I send a break signal in the console client? Press <Alt> + <b> to send a break signal. Or you can press <Ctrl> + <right click> for special commands. How do I copy and paste text in the console client? Using Remotelabs 1.0: To copy text from the console client, select the text with your left mouse button. To paste into the console client, simply right click with your mouse. How do I send “Ctrl” + “SHIFT” + “6” in the console client? I cannot move X2Go windows upward properly on my Mac device when working with two screens. This problem can be solved by changing your screen arrangement. Choose Apple menu > System Preferences, click Displays and then click Arrangement. You will see the arrangement of your screens indicated by two blue boxes. The primary screen will have a white bar at the top of the blue box. From this point, you have to options to solve the problem. 1. Select the blue box with the bigger resolution as primary screen. 2. In case you would like to keep the resolution of the primary screen bigger than the resolution of the secondary screen, you need to arrange the blue boxes in a way so they align at the bottom. What do the symbols in the lab topology mean? Please check the list below for an explanation of the symbols. Device is powered off. Click to power it on. Device is powered on. Click to power it off. 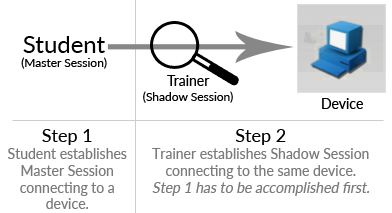 For trainers only: What is the shadowing feature? The shadowing feature can be used by a trainer to log into a students POD in order to help the student. Please read the instructions on how to establish a shadow session below. Ask the student to establish a connection to a device. The shadow feature will not work if the student is not connected! – Log into the lab as a trainer and click on “Lab”. Select the students POD in the dropdown menu in the right upper corner. – Establish a connection to the same device as the student. Hint: If you are getting a “No Desktop found” error when trying to establish a shadowing session, please check if the student has already established a connection to a device. Are there any other ports that are used and not mentioned in the system requirements? There are dynamically generated local ports for localhost sockets. They do not establish an outside connection and therefore do not need to be allowed on your firewall. What are the keyboard-shortcuts for zooming? What is the Connection Test for? The Connection Test assures that all necessary servers can be accessed. Using Windows, it can be found in the “Settings” menu, using OS X, in the “Preferences” menu. The image below shows the Connection Test for Windows. The following improvements and new features have been made and added. The latest changes are on top. If the installation process stops and doesn’t continue (e.g. picture below) please check your desktop firewall or antivirus program. Some users encountered issues with Avast Antivirus and the software doesn’t show a message and blocks the installation process hidden for the user. In order to install the Remote Labs Client (RLC) please stop your desktop firewall or antivirus programm for the installation and reactivate it afterwards. Sometimes the Remote Labs Client (RLC) can’t start because *.dll (e.g. Qt5Core.dll) is missing from your computer. In order to get the RLC running you can copy all *.dll files from the installation path to your System32 folder under your windows installation. In case you are a trainer and need further help, please check the Trouble Ticket System once you logged in. If you are a student, please ask your trainer for help. If you would like to know more about our Remote Lab Service offerings please either contact us via telephone or e-Mail.